My first skiing lesson, I was asked if I was a ‘prima donna?’ and I was somewhat affronted as I didn’t think my attitude was that bad, however once understanding the translation I was rather charmed by the title, and today this is my first blog! 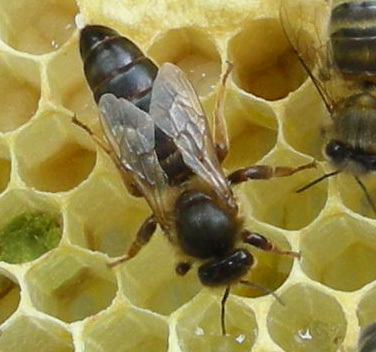 Thinking about beekeeping, our queens can also answer to the title of ‘prima donna’ as they’re like ‘the first lady’ referred to in opera and without our queens the hives soon loose their function. This is a great time of year to start a blog as it’s the beginning of the beekeeping season and I hope not to drone (male bees) too much and hopefully inform about the world of BeeInspired; beekeeping and making wonderfully effective natural cosmetics with our bees’ honey and beeswax. A brief history; some 20+ years ago a friend and I, feeling the need to escape motherhood and have some ‘space’, decided to an allotment would be a productive escape. This partnership soon grew into a women’s cooperative with other friends joining and it was great fun and shared support for us all (we were interviewed on lunchtime TV for some reason). 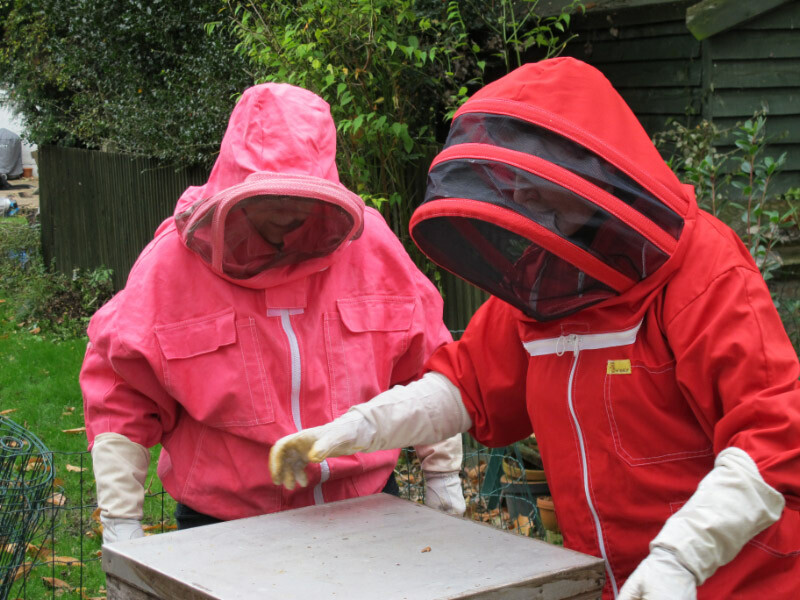 A couple of years down the line some beekeepers took a couple of plots on the allotments and one friend asked if I fancied learning, so we shared the cost of the suits (one adult and one child) and duly enrolled at the club. In those days membership was dwindling and we reduced the average age by a good few years. What those members didn’t know about beekeeping wasn’t worth knowing, what generous people they were with their knowledge and offer of bees, and from all backgrounds too. The one thing we were told from the beginning was that bees don’t read the reference books and don’t do what might be expected – I’ve been kept on my toes ever since! 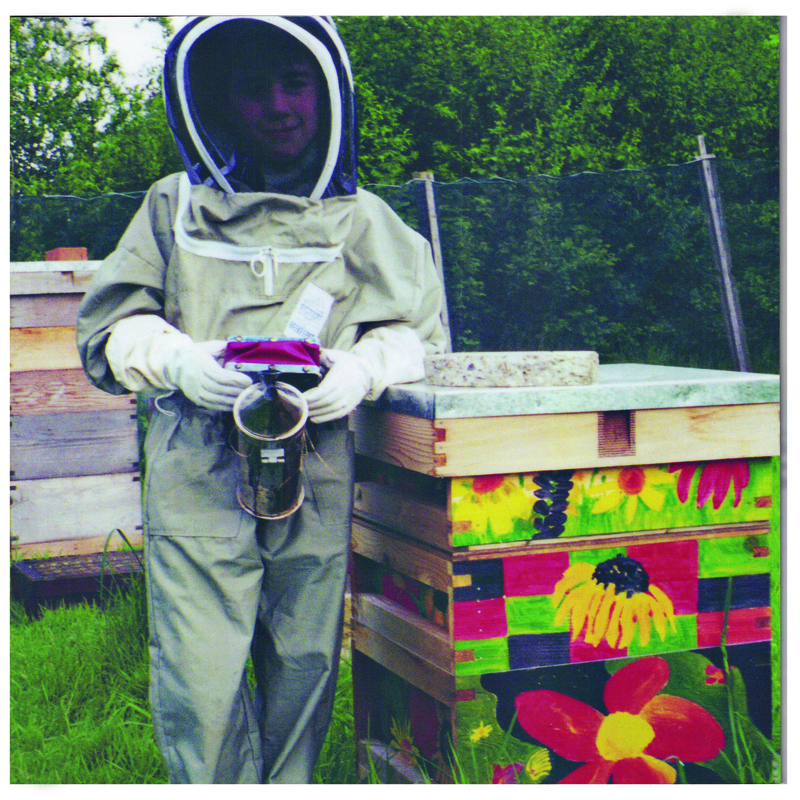 Below a photo of our youngest son aged 5 or 6yrs with our hive, he quite enjoyed going down to the bees then but at 23 he’s not much interested and only 1 colourful box remains. Moving forward 15 years, I met Diane through children and Sea Scouts and discovered many mutual interests and a great friendship developed – most importantly we keep bees together in Diane’s garden. 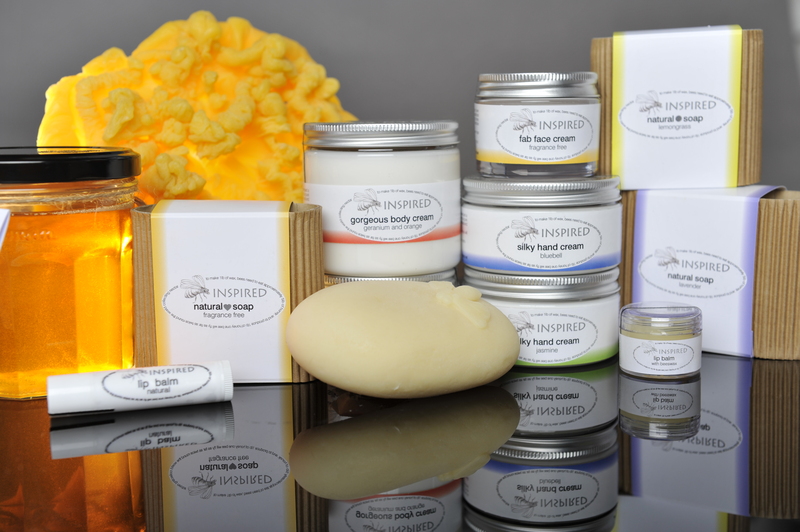 We both love making things and being so inspired by our bees and the benefits they bring in all manner of ways, we determined to make natural, effective and luxurious creams with our honey and beeswax and BeeInspired was created. label design is drawn and designed in-house and is contemporary, informative and simple – having said that people often don’t understand our rebus which combines the drawing of the bee + word inspired = BeeInspired so this might soon change!